Bombay Sapphire gin is pleased to announce that entries are now open for the 2015 Bombay Sapphire World’s Most Imaginative Bartender competition. Now in its fourth year, the competition challenges bartenders to create original and unpanelled cocktails and this year the brand is inviting entrants to mix a sublime serve, paying homage to Bombay Sapphire’s pursuit of the most beautiful botanicals from the ends of the earth. Bartenders are asked to draw upon their knowledge and creativity to take the Bombay Sapphire Gin & Tonic to sublime territory, in keeping with the exotic locations where Bombay Sapphire’s botanicals are sourced, and produce a fresh new serve that is not only original and delicious to taste but also visually beautiful. Alongside details of their cocktail, this year’s competition entrants are also being asked to submit an aerial shot of their serve that captures its sublime beauty by 4th March. Only 10 entrants will be selected to compete in the UK Final, which will celebrate creativity in cocktail making. Each national finalist will have the chance to visit the Bombay Sapphire Distillery at Laverstoke Mill in Hampshire and be expertly mentored by Bombay Sapphire Master Distiller, Nik Fordham, to refine their cocktails and learn about the botanicals sourced from around the world to create Bombay Sapphire ahead of the UK Final on 30th March. All competitors will present their re-imagined Gin & Tonics to a panel of judges at the UK Final and of the 10 finalists, just five will go through to the Sublime Surroundings challenge where they will be required to source ingredients locally and create an inspired serve in just 15 minutes. Not only will the winning bartender secure a place to represent the UK at the 2015 Global Final, they will also go on an exploratory and educational trip to one of the ten exotic locations where Bombay Sapphire sources its botanicals. The UK Final will be judged by last year’s UK winner, Rich Woods of Duck and Waffle in London. Rich will be joined by guest judge Jason Hawkes, a celebrated photographer who has published over 40 aerial photographic books, and completing the judging panel will be Global Bombay Sapphire Brand Ambassador Raj Nagra. 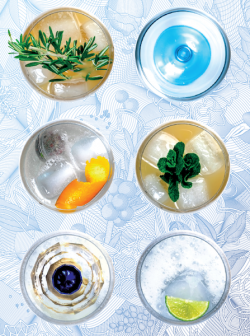 To enter the 2015 Bombay Sapphire World’s Most Imaginative Bartender competition, participants should email mywmibentry@bombaysapphire.com to receive a submission pack and present their entry by 4th March. That’s less than a week away folks so get creative!